Creating a perfectly formed bed of soil ready to embrace the roots of flowers and vegetables requires tools and techniques suited to the task. Cultivators are mainly used to prepare soil for the plants that will grow there, but they can also remove weeds, sculpt the soil into rows and beds or improve its structure to allow air and water to penetrate more easily to the roots of plants. Over time, foot traffic and rainfall cause the soil near the surface of a garden bed to compact. Compacted soil prevents water and air from reaching the roots of plants and prevents water that penetrates the surface from draining away. Cultivators loosen the soil with tines or disks and break it up into smaller pieces. This allows air and water to penetrate deeply into the soil and allows it to drain more effectively, preventing the soil from becoming flooded. The tines of a hand cultivator are especially effective at removing broad-leaf weeds from the soil. A cultivator applied to the soil around the base of a weed loosens the soil around it, making it easier to pull the entire plant out of the ground with its roots intact. Shovels or garden hoes used to remove weeds often sever portions of the root system, which allows the weed a chance to regrow. Shovels are also prone to glazing the soil; spade shovels and trowels leave a section of compacted soil behind when the bottom of the shovel is pressed down into the soil. 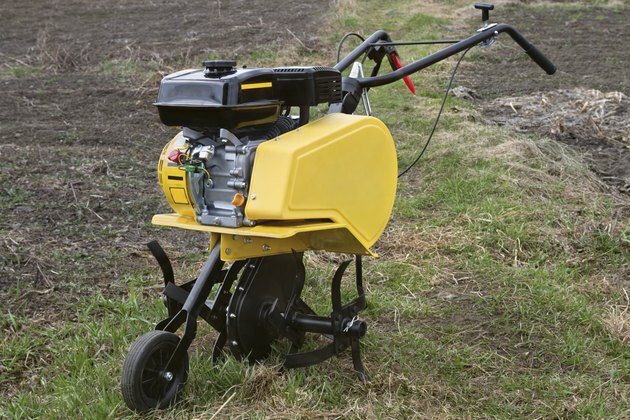 Walk-behind cultivators equipped with rotating tines are designed to turn the soil within a few inches of the surface to aerate the soil and bury weeds. Using a cultivator with this type of attachment between rows controls weeds and incorporates them back into the soil where they add nutrients to the garden. Cultivating more than a few inches into the soil or too close to desirable plants can damage their roots. Cultivators designed to plow the soil into rows use a wedge-shaped blade in place of metal prongs or disks. This type of cultivating attachment creates a shallow trench in the soil ready to accept a line of seeds. Once the seeds are in place, the furrowed soil next to the trench is ready to be pushed over them. Cultivators work best when the soil is slightly moist to the touch; soil that is too dry or wet is significantly more difficult to cultivate. Cultivating clay soils saturated with water causes it to form clumps that will restrict the development of plant roots. Although cultivating between plant rows is an effective way to control weeds, regularly working soils heavy in clay destroys its structure, leading to compaction that inhibits plant growth. Heavy soils should only be cultivated to prepare a seedbed for planting or to mix compost or organic fertilizer into the soil.